Rob's Idaho Perspective: Spring hits Boise! As it sometimes does, the spring weather hit Boise hard this weekend. As a result, we put up the skis and broke out our tandem bicycle. Two beautiful days of riding! Of course, not all of our time was spent on the bike. Sunday afternoon, we spent three hours out in our local trail system - Hull's Grove, birdwatching. It was a very fruitful day. We hiked about a mile from our house to the "lower pond". Here we found the usual red winged blackbirds, but for the first time this spring, the female Belted Kingfisher was there. 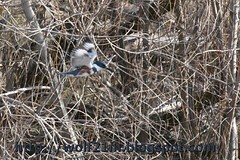 A pair of kingfishers has occupied each of the ponds for the past few years. We also noticed a Pied-billed Grebe! Also the first of the year, although we have seen one there periodically each of the last two years. We tried to get a good photo, but it just didn't work out. Each time the grebe would slip under the water before I got set up. Moving on up the trail toward the "upper pond" we counted the American Robins, Northern Flickers, and Black-billed Magpies. Passing the sand cliffs we spied the female Great Horned Owl in on her nest. The first hatchlings should arrive any day now. It was nearly a month ago when we last saw them copulating. The upper pond was occupied by a Mallard pair and a number of Red-winged Blackbirds. The kingfishers have not yet arrived. A pair of American Kestrels started flying around over our heads. I captured this shot of the male in flight. 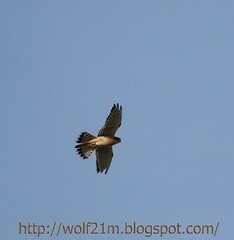 A short distance further down the trail the male kestrel flew over carrying a mouse. We watched as it perched upon a nearby tree. I worked my way around the tree for better lighting, climbing up the hillside to get a better angle. 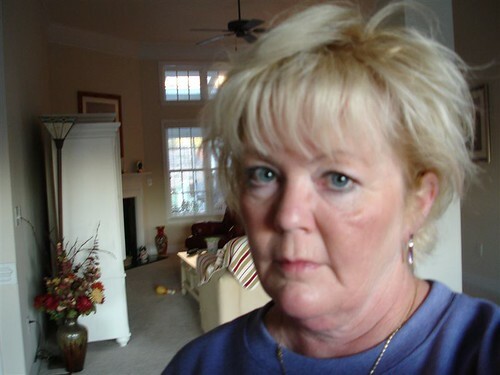 I was rewarded with great lighting and a great angle. We watched as the kestrel continued to eat. Karyn asked why they always start with the head? My reply - they have to start with one end or the other, I'd start with the head too! 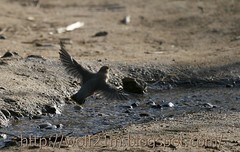 I had my eye up to the viewfinder or I would have seen the female kestrel flying in to get some dinner as well. The male wasn't sharing and flew off down the valley with the female close behind. 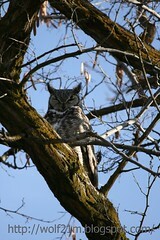 Walking down the "Owl's Roost" path, we observed the male Great Horned Owl (pictured here) sitting in the tree. His viewpoint looks across the small valley, directly at teh sand cliffs where his mate is sitting on the nest. The couple, assuming to be the same, has successfully fledged a total 10 chicks from that nest in the past 3 years. The Redtailed-Hawk was also sitting on her nest where she fledged 3 chicks last year. The male was not to be found. 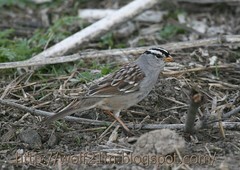 Not always the most exciting of birds, but one of my favorite small birds, is the white-crowned sparrow (pictured here). There are a few predictable locations to find them on this particular route. The highlight of the day was a group of waxwings. We originally counted 36 and thought that they were Cedar waxwings. 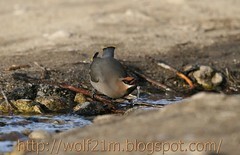 Upon closer inspection (via photos after I got home), most are Bohemian Waxwings. This is a first time that I have found bohemians. 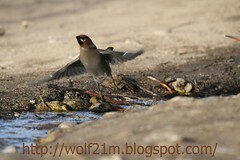 There were a few Cedar Waxwings mixed in as well, but the vast majority were bohemians. The flock continued to dip down a drink from this small stream. With the spring like weather, the trail was very busy with hikers, bikers, and runners. They didn't seem too put out by it. I moved around to get the light at my back and squatted down about 10 feet from the stream. I waited for the birds to return. Finally a gap in pedestrians occurred and I was rewarded with these close up shots, amoung many others. Other birds not mentioned in this post: California Quail, House Finch, House Sparrow, Mourning Dove, European Starling, and Dark-eyed Junco. This article is featured in the I and the Bird #45 blog carnival.